We organise and take part in events throughout the year. Discover our main events here. How well do you know the world you live in? Take the test! Six years ago, Sparknews launched the Impact Journalism Day, the first international alliance of twenty newspapers around the world. Today, this alliance has grown: more than 50 newspapers take their pen every year to write the stories of unknown women and men who innovate to find local solutions to global issues. Together, on June 16th, these newspapers will simultaneously publish articles and videos to help those innovative solutions travel and be replicated. While still underlying current major issues in these reports, the media have decided to show what works so as to restore confidence and inspire people to act. 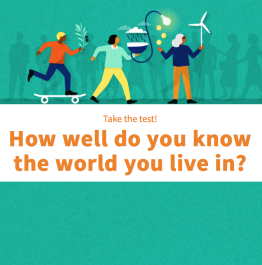 To get ready for June 16th publication, Sparknews invites you to test your knowledge on Sustainable Development Goals, through a dedicated quiz. You will probably be surprised by the current number of centenarians worldwide, the issue our forests are currently facing or the percentage of wealth created that went to the richest 1% of the global population! More than a simple quiz, this test will introduce you to some of the concrete solutions that will be featured on June 16th! Ready to get challenged?